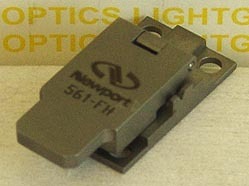 The Newport 561-FH Bare Fiber Holder has a magnetic closure to firmly, but gently hold a single bare fiber. Made of Stainless Steel, it is part of the modular 561 ULTRAlign series of stages and mounts. This mounts on the mini-dovetail rails on the Newport 561 and 562 stages and is held in place by tightening a single setscrew.